Pretty in Pale: Does this look like a cancer patient to you? 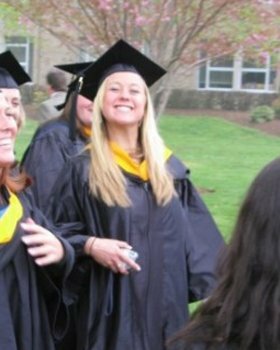 Earlier this week, my friend Rachael, the brains behind the Glenna Kohl Fund for Hope's social media outreach, posted this picture on Facebook of Glenna on her graduation day. If you're part of the melanoma club, you may already be familiar with Glenna's story (if not, you can read up on Cosmo). Long story short: this photo was taken mere months before Glenna found out she had stage III melanoma. She died four years later at age 26. The other day, I was out having a drink with a friend of mine when I mentioned the Portland Melanoma Walk. "Oh yeah, you had melanoma, right? Well, if your going to get cancer, at least it's just skin cancer, right?" I love my friend. She is a very intelligent young woman, but in this instance she was all wrong. This is an uphill battle that many of us early-stage melanoma survivors face. Superficially, it may look like we just had to have a funky mole removed, and then things were golden again. But let me remind you that I had the very same type of cancer Glenna had, and she died. This vibrant, beautiful, fun-loving girl died because of skin cancer. Sometimes I look back at pictures of myself over the holidays in 2009. I had just had my mole biopsied, and was completely unaware that there was anything malignant growing on my body. Unless you looked at my skin cells under a microscope, you would have had no idea that there was anything wrong with me. You can look healthy and happy but still be at risk for developing a deadly disease. Just look at Glenna on her graduation day. Does she look like your stereotypical "cancer patient"? Maybe that's part of the reason why melanoma is so dangerous. It's sneaky and ruthless. Don't ever underestimate the dangers of skin cancer. Just last week, at the melanoma walk, I met friends and family members of three more individuals who lost their lives to melanoma. No one knows your body like you do (OK, except for maybe your significant other). So check yourself out in the mirror. (Just don't take creepy pictures of yourself and post them on Facebook.) Notice if anything changes or looks suspicious. If so, go talk to your derm. It's likely nothing, but you'll thank me if it's not.